Once scattered throughout the land, the Mosaics of the Ancients have been gathered and brought together at the cradle of their once-glorious civilization. As the only one with the knowledge to decipher their riddles, it now comes to you to free their magic and use it to restore the City of the Ancients and bring a new Golden Age to the kingdom. 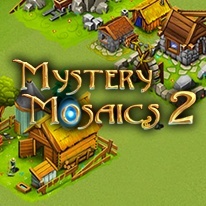 Mystery Mosaics II is nonogram (aka Picross, Pic-a-Pix or Paint-by-Numbers) with a colorful twist: This time around, each mosaic is made up of three colors of tile, each of which must be solved separately for three times the fun. The more precise and efficient you are in solving the game’s 100 levels, the more points you’ll earn and the faster you’ll be able to rebuild the structures of the ancient city. - New three-color Picross puzzles!